At this point in the semester, I am surrounded by individuals trying to ride out the wave of work that surges through a semester. The most important task is the one that is due next, and those long term projects are put off until it is too close to really give them the time they deserve. For example, learning science and doing science are important, but so is communicating it. Between courses, exams, teaching, lab work, mentoring, family and other commitments, how do grad students find time for writing? One of my greatest struggles is determining where in the “To do” list to prioritize this long term task. With the (short) extra time off this week due to snow, I’ve used some of the time to reflect upon the month that was January 2015. I’m actually not a big fan of New Year’s resolutions. I think an arbitrary end point shouldn’t affect your ability to make changes about yourself if you really want to make them happen. Positive changes can happen in any month of the year, why wait till January? I find it amusing when people make broad resolutions like “Eat healthier” or “Exercise more”, as they purposely make them non-specific enough to allow themselves to slack off or forget about them by mid-February. An annual custom I’ve come to enjoy is the extremely crowded cardio equipment section at the gym that seemingly becomes empty usually 4-6 weeks into the semester when exams and papers start piling up. While my resolution sounds clichéd and broad (become a better organizer), I’ve focused on specific smaller ways and used the start of a new semester as a rationale for bucking my resolution trend. My organization goal actually relates to both of my roles as a graduate student, in both my teaching and research. My desks both at home and in my office are a complete mess. At home, I often find it difficult to find space for my laptop at night. I mean, I need to have space for the important stuff like my Staples’ Easy button, right? My desk at my office is not much better, scattered with books, journal articles, and that Science section from the New York Times dated October 14, 2014 that I’m definitely going to read this week. I’ve found this disorganization to flow into 2 key places that affect my daily life: my flash drive and my messenger bag. My flash drive used to look like a 6 year’s old toy chest, scattered with random files of data in raw and Excel formats and folders that say “New Stuff” and “Original Stuff” and it makes me wonder if I’m ready for life after graduate school when I label multiple folders “Stuff”. So, I’ve used this as a jumping off point to organize my flash drive as well as other sections of my computer into labeled folders, placing as much information into folder and file names as possible including semester, year, and full journal article titles. It’s really helped during the writing stage to be able to find that specific experiment or journal article that I used to take me 20 minutes. The second aspect of my resolution focuses on my messenger bag which contains all my supplies for teaching this semester. Rosters, attendance sheets, graded assignments, and non-graded assignments that I need to collect from students that my bosses want for reasons I’ll never understand. All piled and squished into separate folders but some sections having much thicker folders than others despite having the same amount of students, which after inspection usually is my agenda and teaching supplies from 2012. Well, not THIS semester. At least that’s the plan. Only 2 weeks in, I think I’m on the right track. What was your resolution and can you make it 11 more months? Most importantly, prediction that’s relevant for this weekend: Seahawks 28, Patriots 27. Last week, Brandon wrote an awesome post about his five priorities as a graduate student. You can read it here. 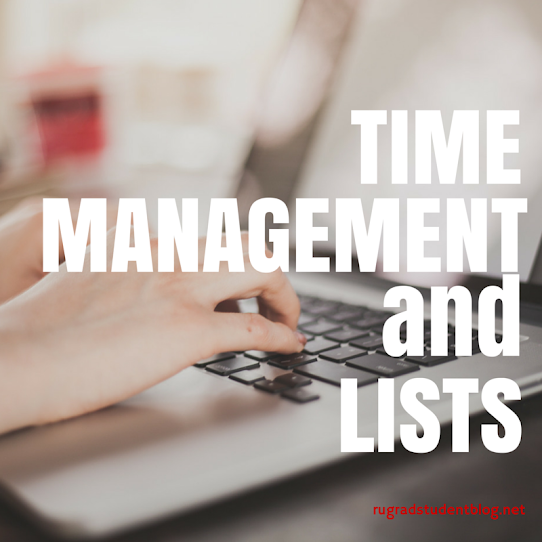 Time management is always such a huge issue for us as graduate students, since we’re often pulled in so many different directions. We are students with classes, but we’re also scholars with research projects, instructors with classes to teach, and so much more. That’s why staying organized is one of the keys to staying sane in graduate school. This is the most obvious use of a list, and what makes lists great. Most days as a graduate student, I have a lot of things to get done, which fall into a variety of categories: experiments, lab maintenance, administrative, teaching, personal, etc. On those really, really busy days, having a list of the things that I need to get done is great because it really helps me with task-switching. Generally, if I don’t have it written down, at least one task will slip through the cracks, such as not remembering that I have to stop by X’s office until 6:15pm when X is already long gone. I use this particularly on writing days (days when I’m not in the lab, but instead I’m working on my dissertation) and usually with a friend. What we’d do is make a list of five things we’d like to accomplish while working in the library. Once we’ve both finished two or three things on our lists, we take a cookie break. This type of list is good for setting clear goals, and also nice for rewarding yourself for reaching them. Another example is my little brother: each day he makes a list of three things he would like to accomplish. He doesn’t consider the day to be over until he’s accomplished those three things, which gives him incentive to get them done early. Any.do: I really like this app because it’s very intuitive and easy to use. You can set list items for specific dates with or without reminders or for a generic “someday”. The app and website both make it easy to drag and drop an item to another day, and you can view your list items either by time view (in order by due date) or by folder view (in order by category). In Any.do you can also add sub-tasks and notes to a to-do list item, and it has a collaboration feature as well (which I’ve never used). One of my favorite features of the Android app is that your to-do list always appears in your pull-down notifications list (but not as an actual notification in the bar at the top, so it doesn’t get annoying). This way whenever I check my notifications I see the things that still need to be done on my list. Todoist: One of the best things about this app is the Gmail integration feature. This allows me to add emails to my to-do list directly from my email window in my browser. Then when I click the item in my to-do list, it will open the email. I’ve found this to be very convenient when there’s an email that requires action that I can’t address as soon as I’ve read it, but I need to respond to relatively soon. Other features include list categories called projects, prioritization of list items with different-colored flags, recurring list items, project sharing with friends or peers, and sub-tasks. Todoist makes it especially easy to add recurring items to your to-do list, as it is designed to recognize certain phrases as cues to create a recurring item (e.g. “Bowling every Tuesday” will create a list item called “Bowling” every Tuesday until the end of time). What about you? How do you stay organized? Do you have preferred apps that you use? Share your thoughts in the comments below! I’ve been in the Volunteer Blog Industry for a solid 3 months now and in that time I’ve learned two things. First, my grammar is atrocious. Second, if it’s one thing that drives readership and discussion, it’s power rankings. During a month where the number of exams and papers are higher than the number of remaining class days, it’s important to think about time management, and where academics currently lie in the power rankings of your life. Now a disclaimer, my rankings may be questioned or mocked, but they are MY rankings. I’d encourage you to place your top 5 in the comments. After all, it is the reason we are here, right? While we all have other obligations, when pressed, I think we would all say on some level that our research is at #1 on most days, right? Thankfully, I’ve been here so long that classes no longer have a place on my rankings since I’m finished with my course load. I can’t stand the taste of coffee so getting a solid 7-8 hours of sleep is almost integral to having a productive day. I’ve often spoke to older people who use their age as an excuse to go to sleep earlier. If that’s the case, I can’t wait to get older. My closest friends would say I watch too much basketball, but how well do LeBron James, Anthony Davis, and Ricky Rubio really know me? Don’t worry, not a total waste of time as I often will watch games on my iPad while on the treadmill. Oh wait, I just finished all my teaching obligations outside the final exam!! If my bosses are reading this, it was absolutely #2, but needed a gimmick for this post. The beauty of my research is that it actually allows me to pile up data for months (I can say this from personal experience), without having to rush to get it done before starting my next experiment. Excel has become my best friend and worst enemy at times, with the amount of manipulation I need to do for Excel to make graphs, however with the help of macros and templates, Microsoft might need to go in my acknowledgements of my dissertation. Now that teaching is over, time for my old #6 to move back into top 5. Let’s hope this old friend (future Hall of Fame status in my Top 5) stays at #5 without going much higher. So, as we wind down another semester, remember to focus on why you are here, but also don’t let graduate school overtake your life. Whether it’s basketball or video games, find something a little fun and stress-less to add to your Time Management Power Rankings this month. What’s your 5 and should it change? To learn more about the author’s suggestions, I suggest borrowing the book from the library or purchasing it. This book has totally changed my perspective on writing. While I understand that writing and preparing presentations of my work is just as important as reading background information and working in the lab, I have not been dividing my time accordingly. Now, I am taking the authors suggestion and planning a few hours every week, on my calendar, just for writing. So far this strategy has allowed me to more efficiently organize my thoughts and make progress writing emails, blog posts and my dissertation proposal. I know that writing is viewed differently between humanities and sciences, but this point is relevant for any field. So, I am eager for others to comment on their own trials and successes with writing productively. What do you do to prioritize writing?